P1 Series for Industrial and OEM Applications. Industrial grade tough: P1 and P1.A Industrial Actuators are compact quarter turn electric actuators which provide low torque solutions for industrial valve or damper control. 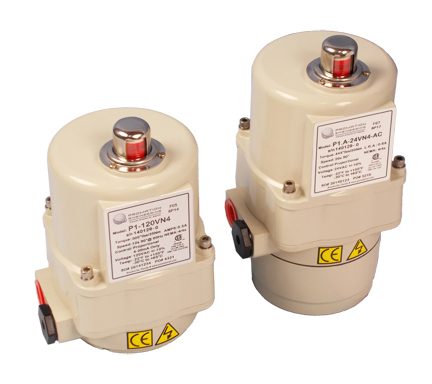 Compact: These compact actuators are designed for limited-space situations and are reliable, industrial grade solutions for smaller valve and damper applications. They have durable, powder coated, cast aluminum alloy housings and are some of the smallest actuators on the market that feature raised position indicators and manual override capability. The P1, P1.A, P1.B and P1.C Series of quarter-turn electric actuators are designed for the rigors of industrial use. Available in torques of 135 in lbs / 15 Nm, 300 in lbs / 35 Nm, and 445 in lbs / 50 Nm; they are suitable for flow control on butterfly valves, ball valves, or dampers. Simple: The P1 mechanical connections are ISO5211 compliant, utilizing an F03/F05/F07 bolt patterns depending on torque output. The manual overrides and raised position indicators at the top of each actuator simplify inspections and operation. Quality: The cast aluminum alloy housings, steel gear drive trains, and RuggedBoard switchcards are a few of the components in our industrial grade tough actuators. Backed by a manufacturer's 18 month warranty. The high quality of these actuators coupled with our outstanding customer service is an unbeatable combination. Excellent performance - created for industrial use!